Hello, we made it! currently we are sat in chiang mai but i'll start at the beginning. we arrived in bangkok last monday in the middle of a state of emergency. guns lined the streets...fortunately they were supersoakers due songkran, the thai new year. it's basically one big water fight which last a few days. though fun at first its starts to get rather annoying when you end up being chased by thai lady boys making snorting noises ie adam. adding to the water is a white paste that they enjoying rubbing on you face. not to be recommended! its was a bit of a baptism of fire so we made a swift exit to kanchanaburi, home of the bridge on the river kwai. here we stayed ina cool little guesthouse right on the river. the garden was lovely and we spent plenty of time in the hammocks and deck chairs. while there we took a day trip where in the morning we visited erowan falls. seven tiers of waterfalls, we made level 4 and had fish nibble on our toes. the thais were pleased to see us even take photos of our pasty bodies! in the afternoon we rode the death valley railway and walked on the actual brigde over the river kwai. they dont care much for safety and a simple mispaced step would lead to falling in the river. we relaxed the next day before meeting some giant ozzies who enjoyed their rum and adam was delighted tp be introduced. it was a fairly quiet place so it was now time to head back to bangkok. we took up residence i the "travelllers ghetto" on the khoa san rd. the hostel was a whole but cost 2 quid each. that night we sampled the local beer and rum which was most enjoyable, waking the next morning in a pool of sweat. the fans in the room not appearing to do their job. we moved on to the trang hotel to join up with our organised trekking tour and the accomodation was an obvious step up in class. that night we had food and a few drinks with the group over the arsenal chelsea match. we have rode river taxis along the main waterway in bangkok and also into waterside suburbs. 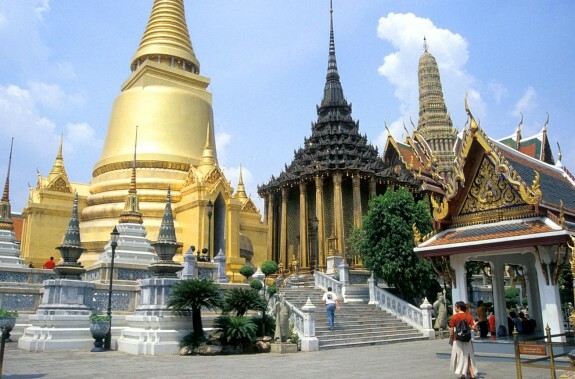 this was a great way to see more of bankok and later that day we went to see the reclining buddha at wat po. this didnt match adams expectations of a buddha constantly leaning back and coming forward again. whether he expected monks to be turning some sort of wheel to create this motion is unclear. now we rest in chiang mai after a surprisingly luxurious night train to the destination. needless to say we have all made the error of getting a healthy burn. ps i have just learned that 373 people died during songkran...welcome to the dangerzone!